What’s the difference between a Dockboard and a Dock Plate? Here you can see the difference between a dock board and a dock plate. The dock board has curbs, where the dock plate does not. We’re often asked about the differences between our dock boards and dock plates. These items can get confused with one another and it’s our goal to keep customers informed. Dock boards provide loading and unloading capabilities in heavy-duty applications and bridge any gaps that can be a safety concern. They offer ease when using forklifts and other material handling equipment. Copperloy’s dock boards come in steel, aluminum with bolt on steel curbs, and aluminum with welded curbs. Dock boards can handle capacities up to 20,000 pounds and have sides (or curbs) that prevent run off. Dock plates are very much like dock boards but don’t have curbs. These are used to bridge a gap from one area to another in material handling operation. However, unlike dock boards, dock plates are a flat piece of metal with a slight bend for easy transition. 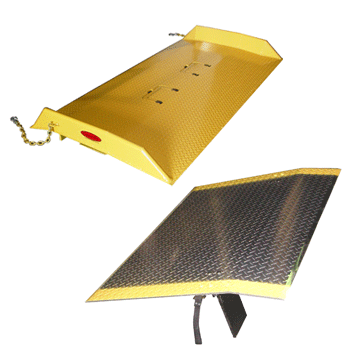 Dock plates come in either steel or aluminum and can reach capacities up to 17,000 pounds. Interestingly, the extra capacity that dock boards are able to achieve comes from the structural addition of curbs. People often ask about the difference between our dock boards and dock plates, their applications, and which are best for their needs. Copperloy’s steel dock board just as great in grey rather than the traditional yellow. Deciding between dock boards and dock plates starts with your capacity needs and application. For heavy-duty applications that need higher capacities and use forklifts, dock boards are the best solution. However, if you’re not using these for heavy-duty loading and unloading, then a flat dock plate that offers easy transition from one place to another is the more economical choice. When it comes to deciding on a dock plate over a dockboard, keep in mind that dock plates do offer many advantages. One benefit is that a dock-board’s curb can get in the way. For example, if you have you have extra high-unitized loads where fork trucks cannot lift loads above the height of side curbs, dock plates are a better option. They are also great for irregular or sharp turns, where, again, a curb could get in the way. Copperloy offers custom dock boards and custom dock plates to meet any requirement or unique challenge. Our custom manufacturing and fabrication team can engineer exactly what you need from start to finish! You can read about a custom rail board we did here. When it comes to safe material handling, Copperloy’s inventory does not end at dock boards and dock plates. 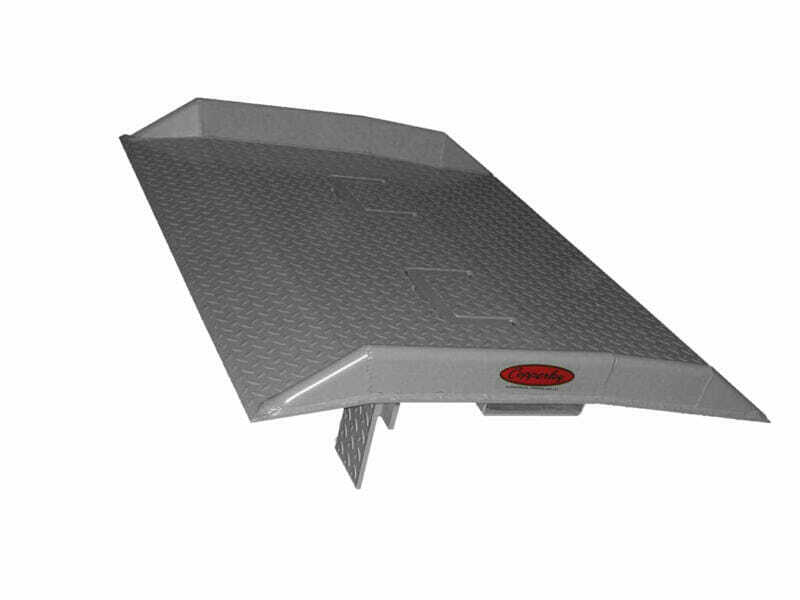 We offer customers a wide variety of American-made mobile yard ramps that provide a loading and unloading facility where one isn’t already established. This wide range of equipment includes: mobile yard ramps, dock-to-ground ramps, truck ramps, and forklift ramps. Learn more about what Copperloy can do for your material handling needs, by calling us directly at 800-321-4968 or clicking here and filling out the form.